Do animals mope and whine? Not really (unless, of course, your name is Eeyore). That's because most members of the animal kingdom are natural optimists: hopeful, confident, even altruistic. Case in point: If awards are to be given for service to others that advance the well-being of their fellow animals, we nominate the Agouti. I found that about the sweetest thing I’d ever heard. Not that the eight-pound rodent (roughly the size of an adolescent bulldog) slams into trees on occasion. But that the leopards, jaguars, crocodiles, and harpy eagles of the jungle let the agouti flourish. That feels optimistic somehow. 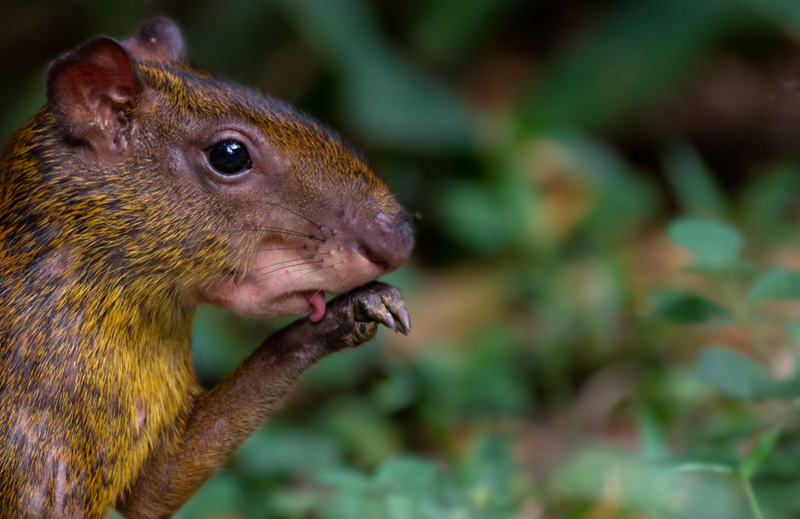 Also, the tail-less agouti – speckled with orangey red hair – is one of the cuter rodents. Their squeak sounds like a honk. And it can jump six feet in the air and land facing the opposite direction. Neat. But here’s the important part: They’re also fond of “scatter-hoarding” black palm seeds. They bury them in grand caches, then dig them up again to carry to another cache. This can happen dozens of times. (Sometimes, not always, they eat the seeds.) Turns out, all this hoarding is crucial to the distribution and growth of black palm trees. Maybe this is because agoutis are obsessive-compulsive Type A personalities. Or maybe – we think so, anyway – all these feverish exploits are because the little agouti are natural optimists who don’t see just a seed in their path, no, but a potential food source or a potential basket spun from the fibers of the black palm. And so, dear agouti – grand jumpers, survivors, honkers and believers in basket weaving! – we just want to thank you. And to write you a haiku. Robert Reid is the editor of MO/AD magazine.